Haglund’s deformity, also called pump bump, winter heel, Mulholland deformity, or retrocalcaneal exostosis, is a bony enlargement of the posterosuperior heel bone, called the calcaneus, at the insertion site of the Achilles tendon. The Achilles tendon is the tendinous combination of the calf muscles, consisting of the gastrocnemius, soleus and plantaris muscles. 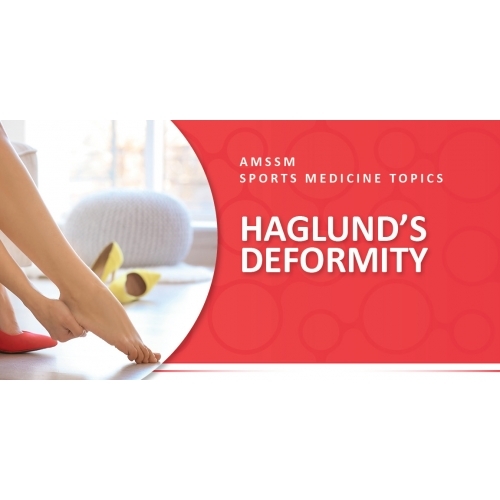 Haglund’s syndrome is a condition that results when Haglund’s deformity leads to inflammation and pain of the Achilles tendon, subcutaneous calcaneal bursa, and/or retrocalcaneal bursa. The subcutaneous calcaneal bursa is a fluid-filled sac located between the skin and the Achilles tendon. The retrocalcaneal bursa is a fluid-filled sac located between the Achilles tendon and the calcaneus. A sports medicine physician will take a history of the condition and perform a physical exam. The physical exam will include close examination of all of the posterior heel structures. They will likely order X-rays of the feet and ankles and may perform a diagnostic ultrasound to evaluate for the bony enlargement at the posterosuperior calcaneus and signs of inflammation of the Achilles tendon and/or bursa. If conservative treatment options fail to improve the condition, then more invasive options are available. A sports medicine physician can perform a local corticosteroid injection in the bursa to decrease pain and inflammation. Regenerative medicine interventions like Platelet-Rich Plasma (PRP) injections may be considered in some cases. Surgical intervention is the last option and involves removal of the bony enlargement of the calcaneus, called a calcaneus osteotomy. Surgical intervention can be performed with an endoscopic (minimally invasive) technique or an open technique. Return to play and return to normal shoe wear is dependent on the level of pain. If surgical intervention has been performed, then return to play and normal shoe wear is typically 3-6 months after surgery. 2. Netter, Frank. Atlas of Human Anatomy. 4th ed., Saunders Elsevier, 2006.